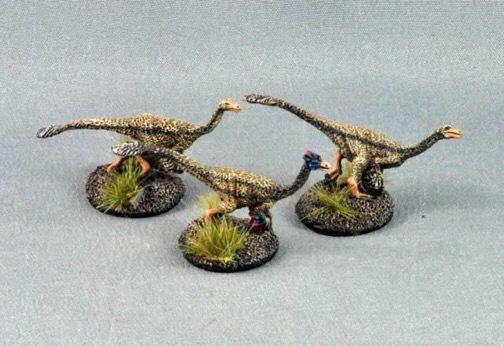 This is a collection of prehistoric animal models from our other ranges. All have been designed with the latest scientific research in mind. 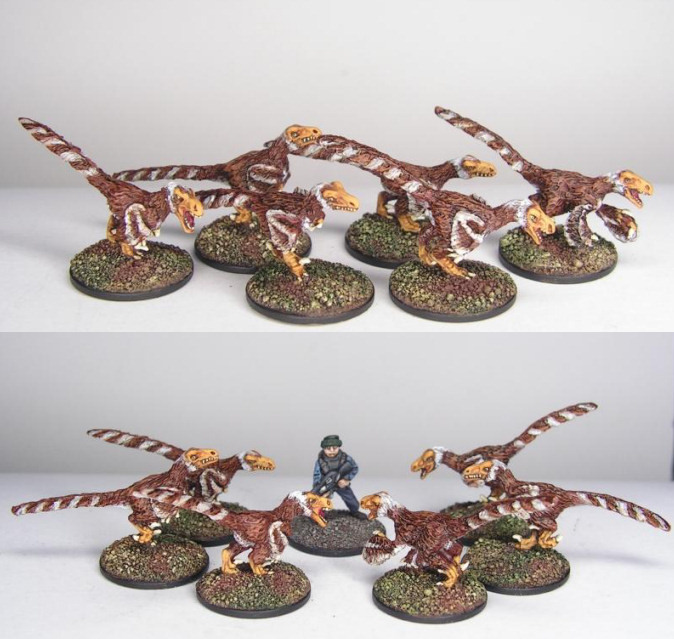 The models are all in scale with each other, being a consistent 1/100th scale (so a human being who is about 1.5m tall from the sole of the foot to eye level would be 15mm tall, hence the reference to them being "15mm miniatures"). 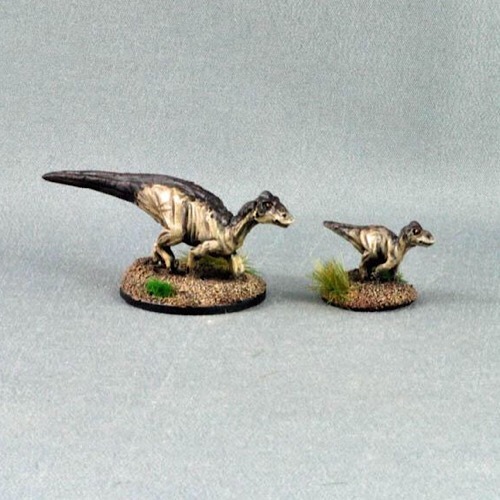 The first large batch depicts the dinosaurs of the Hell Creek formation at the very end of the Mesozoic Era, and features some of the most well-known dinosaur species, such as Tyrannosaurus rex and Triceratops. The Tyrannosaurus is depicted without feathers, as recent scientific conclusions on this animal seem to support. Optional display feather parts are provided for the animal's vestigial forelimbs. 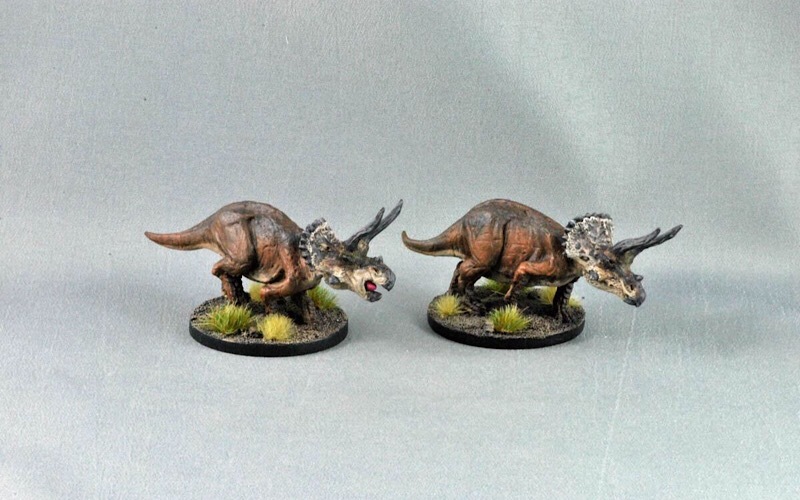 The Triceratops adults have separate swappable heads, and they attaché via a ball mount so there's lots of pose options possible. The Edmontosaurus is depicted with the comb on top of its head, as recent evidence suggests. 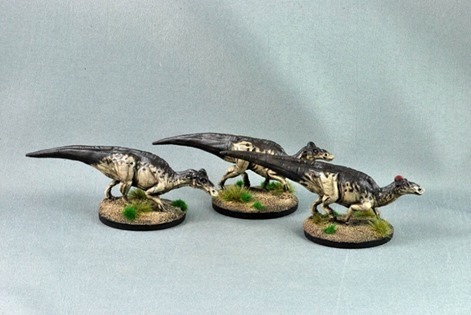 It's a simple matter to remove it with wirecutters and then file in down if you prefer the more traditional look for this most famous of the "duck bill dinosaurs" (formerly called Trachodon). Deinonychus is not actually situated in the Hell Creek, but there are enough findings of teeth of Dromaeosaurids in the Hell Creek matrix to support the idea of a very similar species. 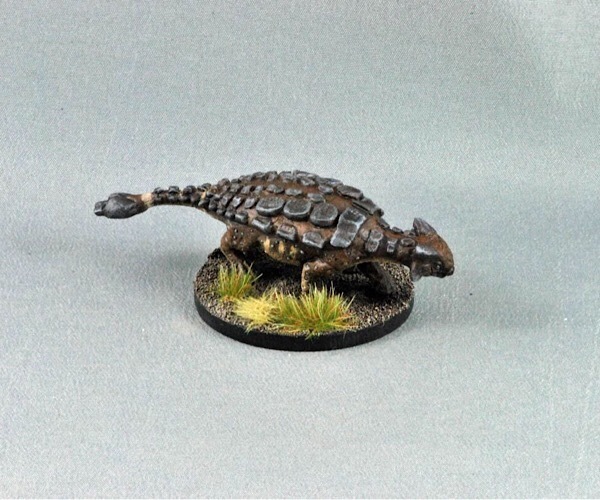 Ankylosaurus was a formidably armed and protected dinosaur as can be seen from the image! For the larger herd animals, it's possible to make even more pose variation with such minor revisions as bending tails and heads slightly -- we've had these cast in white metal to make that possible, but care must still be taken when bending and we can't accept returns if you break the parts when bending them. The Tyrannosaurus is pewter (to keep the weight down and increase ankle strength) so we don't recommend bending it. Juvenile sets are provided for realism and to require protection from the herd, and as an objective for predators. We have also released the first sets of dinosaurs from the Morrison Formation in the Late Jurassic Period in North America, for the greatest predator of that biota, Allosaurus. 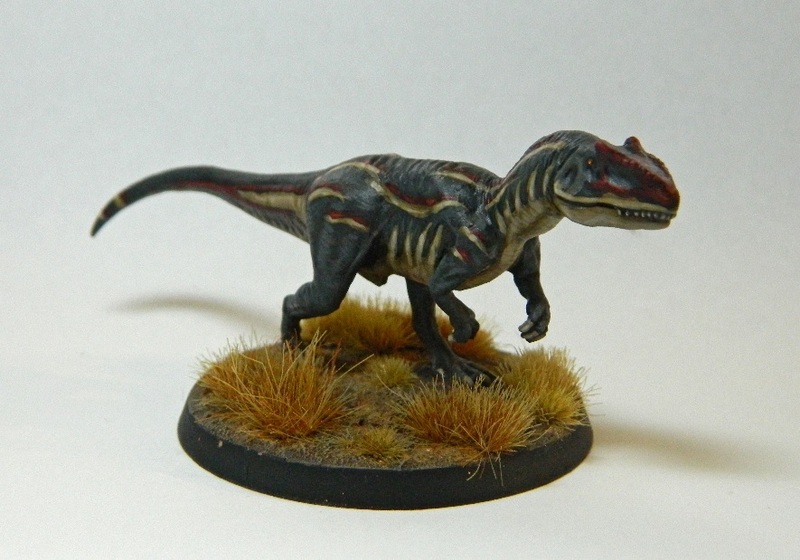 We have also released an even bigger model to represent Epanterias, which may have been a separate genus altogether or, as many believe, just a very large alpha Allosaurus. Below the Dinosaurs are some more recent animals -- Sabertoothed Tigers and Wooly Rhinos. We intend eventually to expand the prehistoric mammals, and also to add the Morrison formation, probably the second most famous formation after Hell Creek. 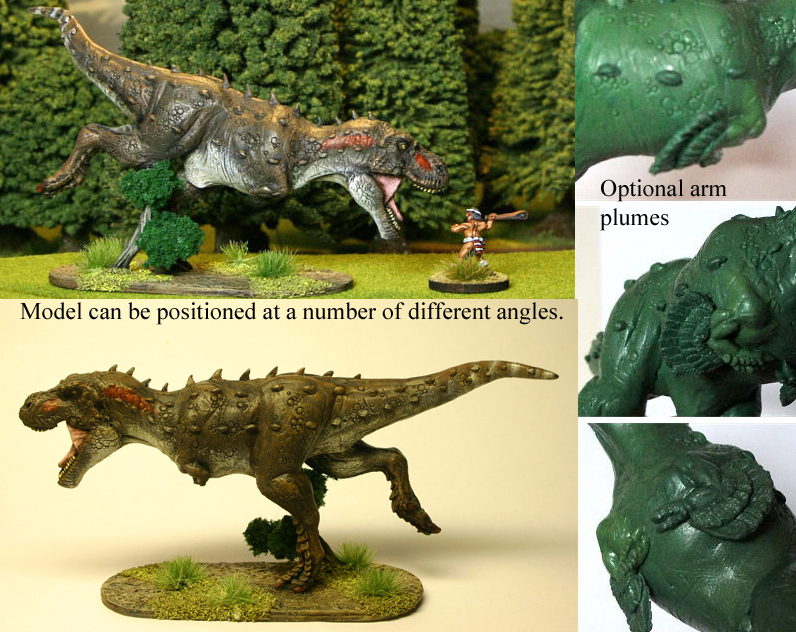 Models are supplied unpainted and are not for children as they have small sharp pieces and may present a choking risk. Some minor assembly may be required. 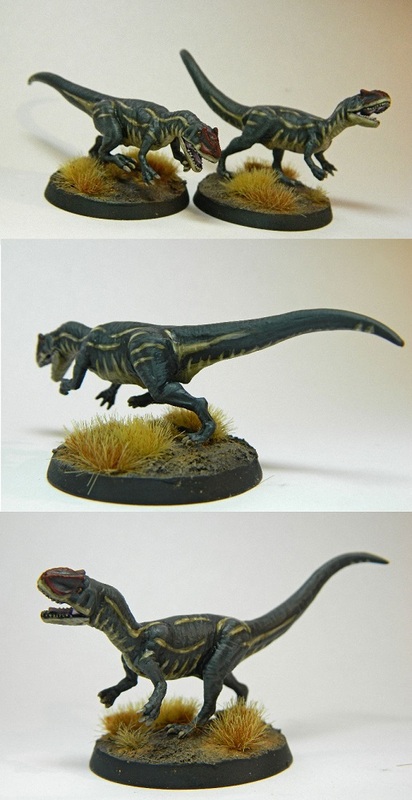 Bases not included except on the Tyrannosaurus.